The weekly Strength & Conditioning Training for boulderers and lead climbers. 800+ Chained workouts to get stronger and to develop your anaerobic fitness and maximum performance. Build a physical frame to avoid injuries and unlock your full performance potential. 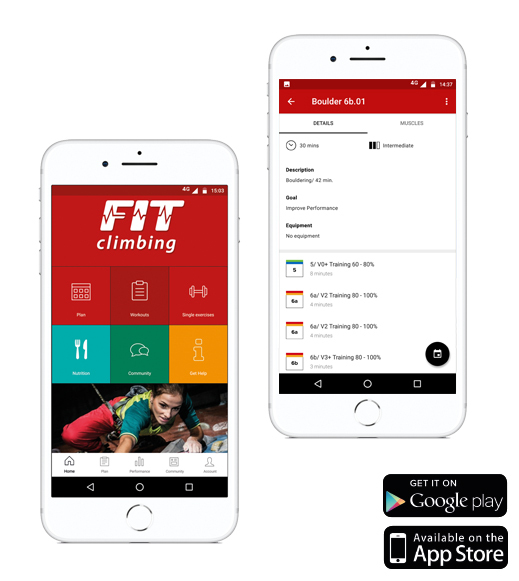 Download the FITclimbing app in Google Play or Apple Store. Get access to all FITclimbing workouts, get connected with the FITclimbing community, join challenges and track your performance. Plan your weekly training easily with the FITclimbing workouts and check upcoming activities in your calendar. and have a lifetime injury free and a balanced climbing life. Let's make climbing training mainstream. Develop a solid base, unlock your full performance potential and have an injury free and balanced climbing life. Chain easily from one workout to the next one and make solid progress by training with consistent loads in a similar pattern. Measure and control the optimal balance between your training load and recovery to make your training efficient. Develop climbing power, improve your local anaerobic fitness and increase your maximum performance. And start training to build a solid base for having a lifetime injury free and balanced climbing life.